Last last week, I was reading the latest issuance of the BIR’s Revenue Regualtions (RR) No. 3-2010. And this is all about an additional taxpayers requirement. Yep yep, the new regulation is requiring all taxpayers to submit a “Statement of Management Responsibility” using, let me repeat, using the BIR required format. Wow, and mind you blog readers, the said Statement of Management Responsibility is for Bureau of Internal Revenue purposes only and is different from the Statement of Management Responsibility required by the Securities and Exchange Commission (SEC). 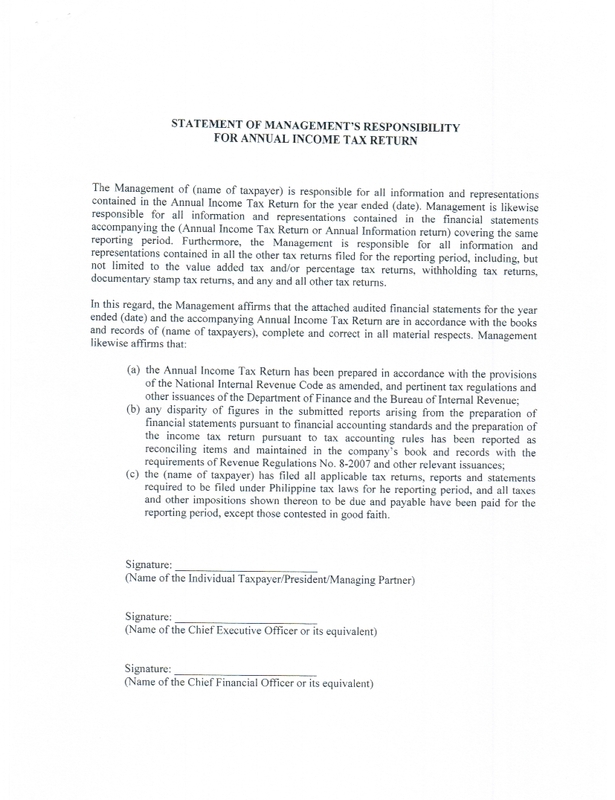 Anyhow, please take note, again… again…again, please carefully note that BIR will not accept or receive your income tax returns, together with the Audited Financial Statements, unless the said statement is duly signed by required officials of the company or the business owners per se. Oh by the way, this requirement is effective na on the April 15, 2010 filing. Okay, so, this means that 2009 audited financial statements will now include this requirement. Business people, partners, business enthusiast, business minded one, this is for you to take note. Huh! seems the BIR is now so so serious in their drive to collect taxes? Well and good, hoping that the monies yes tax collections will be used to ()^^%^*&))*&%^%^%$#$ hahahahaha. Hmmmmm… nevertheless, here is the link to the RR and the required format of the Statement of Management Responsibility for your reference and information.